Do you want to start a Facebook group? Are you wondering how to get new members to join your group without resorting to paid ads and boosted posts? Do you want to get your group members to ACTUALLY engage in the group? Are you curious how to get your Facebook group to make a purchase? Not sure how to get your Facebook group to GROW your email list? Guess what? I was pretty confused when I started my Facebook group, too... but then things started looking up. Yes, it's true! If it happened to me, it can happen to you! In January, 2017 I started Blogger Insights - a "no BS Facebook community for bloggers from any niche". Within a few months, Blogger Insights exploded! 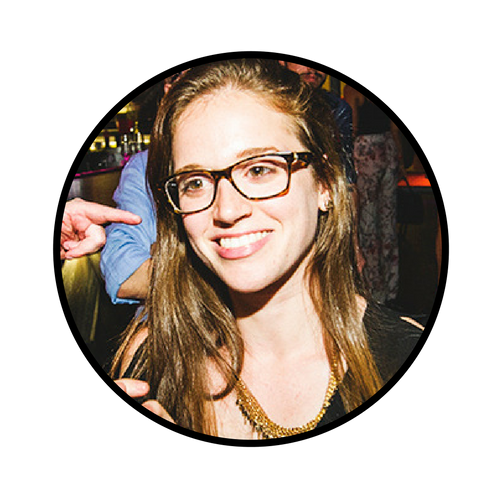 After just 6 months, Blogger Insights had over 14,000 members in the group. 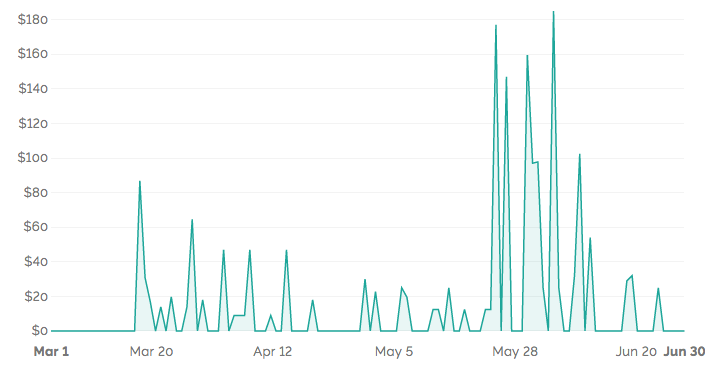 It meant that my email list started to explode. And my traffic (which barely existed before), also started to grow as my Facebook Group membership grew. Plus, as I started to develop products to sell, my sales started to climb! Number one: Some people never got started even though they should have. Number two: ​Many who did get started, struggled to get people to join their group. Filled with information on how to start, grow, nurture, manage and monetize a healthy and successful Facebook group for your blog. ARE YOU READY FOR A FACEBOOK GROUP? Starting a Facebook group can be a tough decision to make. So we'll start with the beginning - understanding the value of a Facebook group and recognizing the signs of Facebook group readiness. Are you feeling nervous that no one will join your group? I'll show you everything that I did (plus more) to promote my Facebook group on my site and off my site to get as many new, qualified group members as possible. So you have group members but it feels like YOU'RE the only one talking! Let's fix that problem, shall we? I'll show you how to create and nurture engagement so that your dud of a group turns into a thriving community. Sure, you might be scared of going in front of the camera, but rest assured, there are many benefits to utilizing the Facebook Live functionality within your Facebook group! I'll show you how to get the most value out of your live streams. Take a deep breath while I walk you through the setup process. I'll give you important information on how to name your group (you won't want to skip this section) and I'll provide step-by-step instructions on how to go about the technical setup process. Growing a Facebook group is one thing, but managing it well so it doesn't consume your life is a whole other battle. I'll show you how to optimize your Facebook group management so it doesn't turn you into a sleepless beast. Betcha didn't think Facebook groups had anything to do with email lists, am I right? Well, I'm happy to share my method to growing an email list without generating any new content. Doesn't that just sound like the dream? In reality, the majority of the strategies and methods taught throughout the 77 pages of the ebook will inform your sales approach and help you turn more of a profit. But we tie the sales funnel together in this last important chapter! 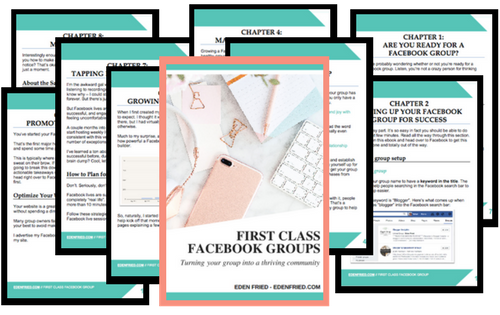 Even if you just have the bare bones idea for a Facebook group and nothing much more than that, this ebook is for you. I was exactly in your position in January 2017. If I had known then what I know now (and what's included in this ebook), live would be way different and I would have achieved success so much quicker! Are you an affiliate for a product you love or do you have your own product that you sell? Facebook groups are a great way to create a community of people who fit your target audience. You can provide a ton of value in Facebook groups and in doing so, you can nurture a community filled with people who will want to buy from you. If you already have a group, this ebook is truly the perfect fit for you. You'll learn how to refine your group to make sure it's optimized for success and then you'll implement the promotion strategies that I teach. You'll not only see quick growth in your group, but you'll also see a ton of engagement, too. Even though you have a decent number of group members, getting group member engagement can be a whole other challenge! I'll show you how to engage with your community creatively to entice responses and get more people involved and engaged.